Mississippi Roast is the absolute best slow cooker roast beef you will EVER make! 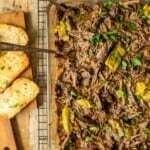 This Mississippi Roast Recipe has been made famous throughout the years and is a must make! Mississippi Roast in a crock pot is perfect on its own, for tacos, nachos, sliders, and more! You won’t believe the flavor in this slow cooker goodness. 12 pepperoncinis a sweet and tangy Italian pepper found in the pickle or Italian foods aisles. Set roast on a small baking tray and rub it with salt and pepper. Sprinkle the flour over the roast and massage it into the meat. In a large skillet, heat the oil over medium high heat until it shimmers. Place the roast in the pan and sear it 4-5 minutes until it browns and a crust forms. Turn the roast over and sear on the other side. Spray a slow-cooker with nonstick spray and place the meat in the bowl. Add the butter and pepperoncini. Cover with the lid and set the machine to LOW. While the roast heats, combine mayonnaise, vinegar, dill and paprika in a small bowl to make a ranch dressing. Whisk quickly until emulsified. Add the buttermilk and whisk again. Pour the ranch dressing over the roast, cover and continue cooking 4 hours. After four hours, test to see if the meat is tender enough to shred easily using two forks. If the meat isn’t ready, cook up to 4 more hours until roast is tender, depending on the size of the roast. To serve, shred the meat and mix the gravy together with the roast. If desired, purée the roast “gravy” with a hand or stick blender, then mix it with the shredded roast. Garnish with chopped parsley and serve with egg noodles, potatoes or on sandwich rolls. Use your imagination.